Don't you ever wish you had another chance to try something new? 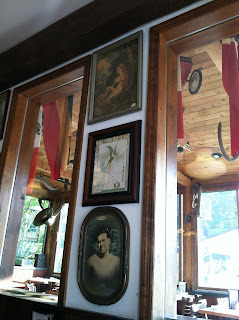 During our mini-vacation in the Catskills, I did exactly that. The restaurant was nestled on Main Street, the only street in Tannersville where we were staying that had some sign of civilization. It was between the Last Chance Cheese and Antiques or the Tuscan Grille featuring all-you-can-eat steak Friday, and unfortunately I decided on this one, because it looked pretty funky and lively. Well I wasn't wrong about the lively part, since it was the only restaurant in town that had some business. 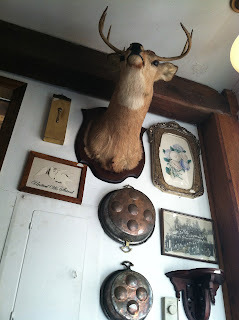 We were at once taken by the 50-ish decor, replete with deer head fixtures, old photos and antique decorations. The first thing that came was some bread sticks and warmed up bread with butter. 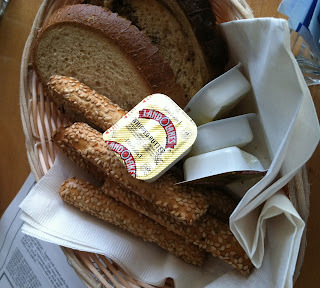 The swirly rye bread looked pretty good, but tasted pretty dull (they also turned stone-hard rather quickly). The bread sticks were alright though. 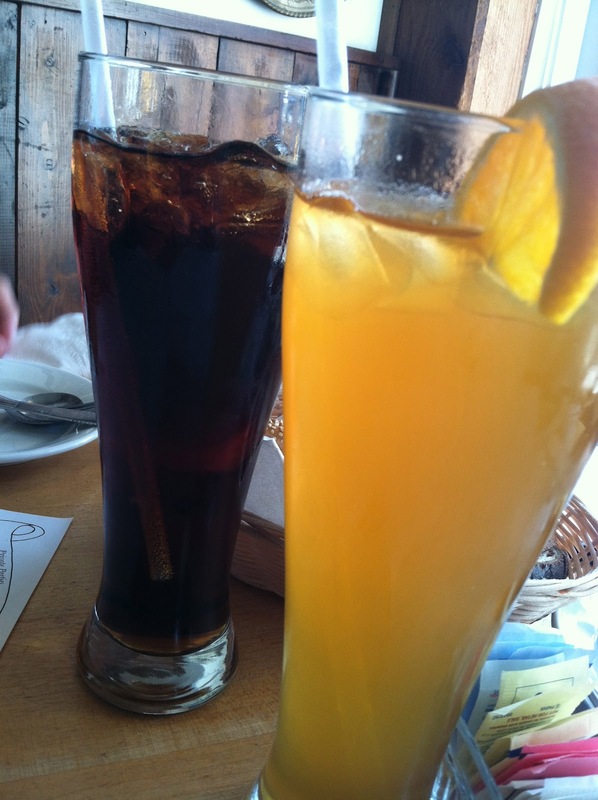 While deciding between the French melt, portobello mushroom in a pita or the bison cheese burger, our friendly waitress served us some coke and iced tea. The iced tea tasted more orangy than lemony, and garnished with an orange. Sipping on it, the waitress came over and at the spur of the moment I decided on the bison cheese burger, remembering my great experience from Bareburger and the regret that I didn't try bison last time. Hubby, craving for beef, ordered the hanger steak special. The service was pretty slow, even though there weren't that many customers that day. We sat inside, watching a group of four chatter outside on the deck with a plate of nachos. 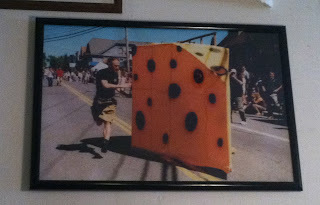 While waiting, I took a tour around the cheese deli and candy bar. 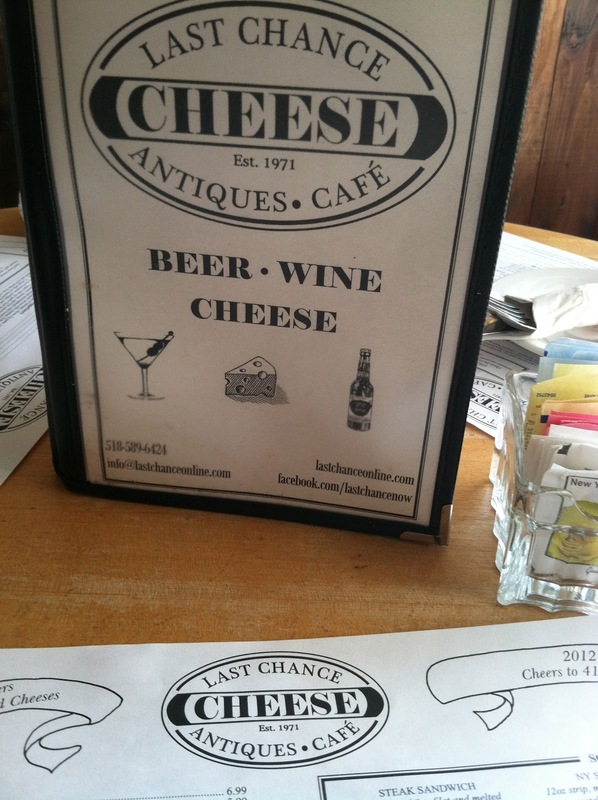 They really did have a wide selection of cheese. According to the brochure they boast 300 different kinds. 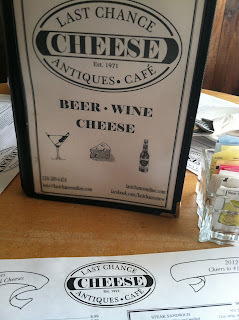 I should have tried a fruity cheese on toast, or the potato knish with melted brie. About 10 min later, hubby's salad came with the in-house balsamic vinaigrette. The greens looked kind of wilted, and the dressing was too sour for my liking. Hubby only took a few bites, wanting to save room for his meat. After a few more moments, my burger finally came! A layer of cheese was melted on top of the meat, which made the burger look pretty rustic. The hanger steak on the other hand, didn't look too appetizing. But looks can be deceiving, because after one bit, I was smitten. The meat was tender, not burnt, and tasted absolutely savoury with the sweat BBQ sauce. The bison tasted a little gamey, but I thought it was rather fitting considering we were in back county. The fries were too dry and overcooked, although the skin was pretty crunchy, which I definitely enjoyed. 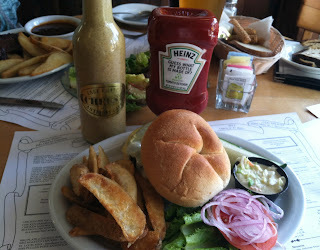 I ended up dipping my fries and the burger in the BBQ sauce. My meal came with a side of coleslaw and a pickle. The coleslaw was alright, just too much mayo. The pickle was bland and too sour. So the next time a last chance beckons, ignore it and get Mexican or even Chinese takeout instead. Take it as your last chance to run away from a gastronomic disappointment.